WARNING: I AM NOT AN EXPERT ON THIS SUBJECT AND LIKELY HAVE MANY THINGS WRONG. IF I AM WRONG, CORRECT ME. YOU MIGHT ACTUALLY CHANGE MY MIND. I think arena points should have a bit more complexity to them, but with a better point award system. 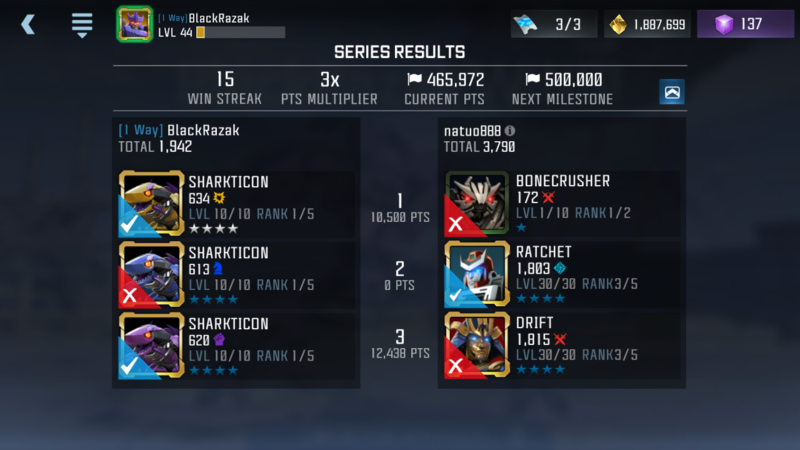 Right now, if you use a five-star bot against one-star bots, you get the most points. What I believe is that points should be awarded based on the opponent tier you beat and what tier you used. For example, people who defeat five-star bots with one-star bots (if you actually have done that, you're a f*cking god) get the most points. However, one-star vs one-star would award a normal amount of points. In short, tier difficulty for you awards more points. I think this would better reward people who challenge themselves in the arenas. It feels pretty crummy to only be given eight thousand points for beating a five-star with a three-star. The points are related to not only your bot but the opponent's (5* vs 5* grants more than 5* vs 1*), but yours weighs more. I always thought arena points should take into account balance health as well. For example if I kill a bot with perfect fight, I should get more points than if I killed a bot with 5% health left. That’s would be very helpful for APK users because it took them 1 hit to kill the AI. Yeah but using APK would get them banned anyway. I was more thinking of the effort of manually fighting vs autofighting. For me I autofight in the background when I do other stuff but there are some friends that really manually fight for their arena points. I think they deserve more points for their effort. I completely agree that your remaining health points should award extra points. Maybe even with a perfect fight bonus or something like that. As it stands arenas is just mindless mashing of the right side of screen until the opponent dies up until double digit streaks. Also I believe fights need to award more points or the milestones need to come down a notch, it’s not worth grinding hours a day for a few arena crystals and some other reward. Or even a milestone reward boost would be appreciated instead of less points needed. As it stands the rewards aren’t worth the grind imo, so I don’t do arenas much. This would give a little more motivation to grind them. Going to hold my comments about any possible cheating going on. Some very interesting ideas in here that I'll pass along to the team. That said, on the topic of cheating... If you believe you have information on some wrong-doings in the game, please do not hesitate to let us know! We want this to be a fair place for all! If I can make one suggestion though for the dev team, please fix the sandbagging opponents. Ok, it’s an easy win but the points go down if your using one of your top teams, meaning less points (I’ll get a SS later, not on just now) or a more difficult fight than necessary for a weaker team. My usual last team (mix, hound, whoever’s left I’m not fond of) has absolutely no chance at r2 4* against a pair of r3 5* because they’re paired with a 1*. I don’t know the algorithms or anything for deciding whose bots you fight, but I don’t sandbag, and would prefer if the AI didn’t either. Sometimes the matchups leave me with no option because they’re ALL sandbag teams. By any means, if a player is sandbagging then the AI can sandbag away on its own accord, but something to check if the player is sandbagging before the AI decides to do it itself would be great. If someone break through my 30k base using 3* without getting any damage then you must share specifics surrounding the investigation or outcome because it’s my base not yours. Playing the arena can train the technique. It is a very good way. It just takes too much time to complete. Is there a better way to do it? Nope. Kabam keeps turning the Arenas into a grind session.